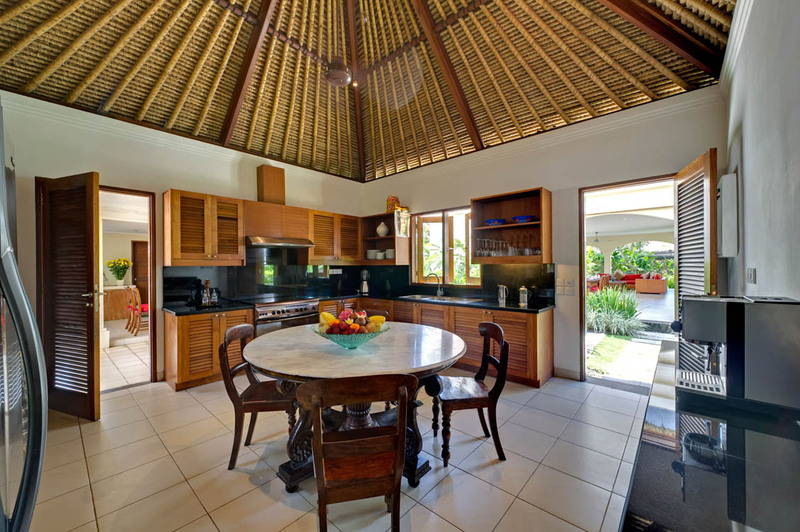 From $ 465AUD per night We have direct contracts with most villa owners. We don't add any booking fees. We are 100% transparent with no nasty surprises. 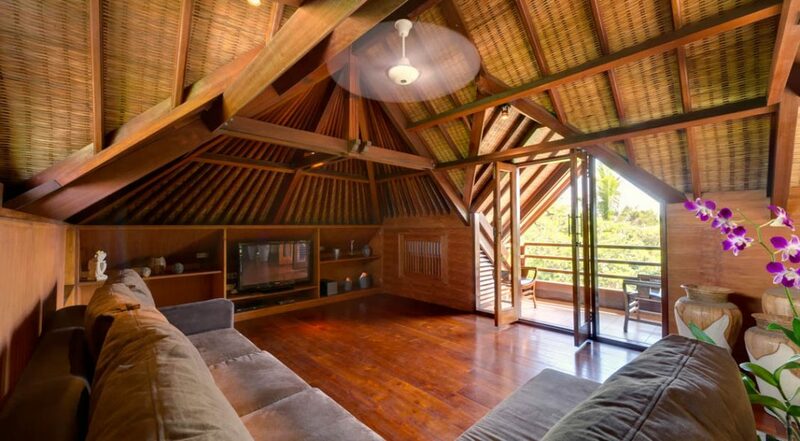 Peaceful, relaxing & private Canggu villa - rent this now! 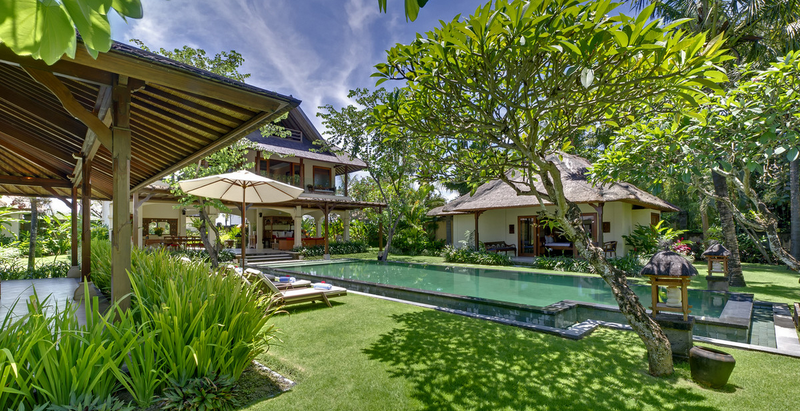 Villa Asmara is a stunning 4 bedroom Canggu villa holiday rental nestled within the serene and enchanting village of Cemagi in the Canggu area. 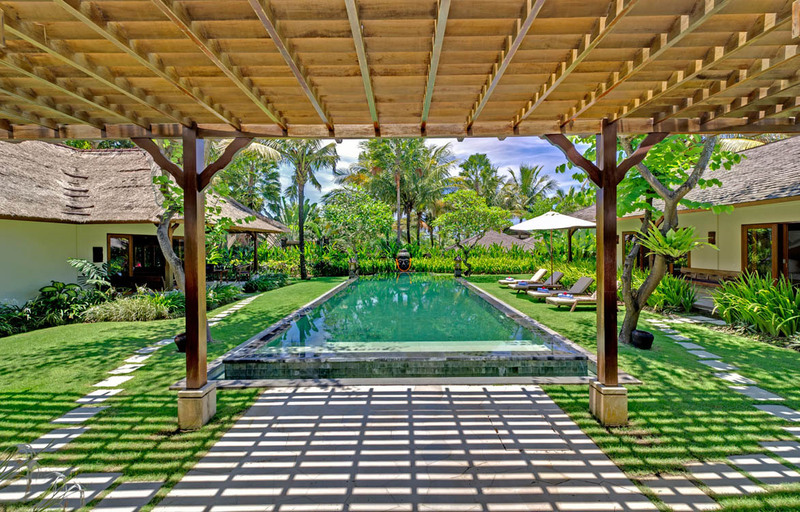 Surrounded by lush rice fields, rich vegetation, local farmers and lovely sights, the villa offers the ideal retreat from the hustle and bustle of everyday life and is in one of the most beautiful areas in southern Bali. 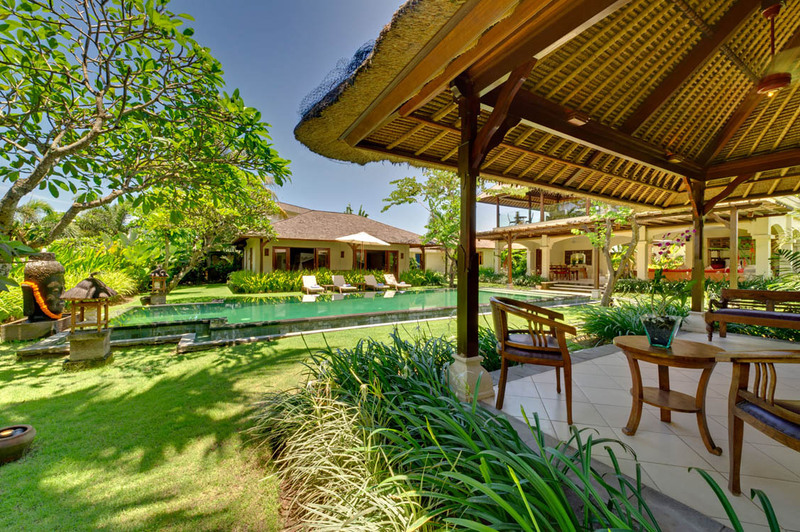 Spread over 1500sqm of land, the villa can accommodate up to 8 persons, making it perfect for families and groups, as it offers ample space for relaxation and comfort. 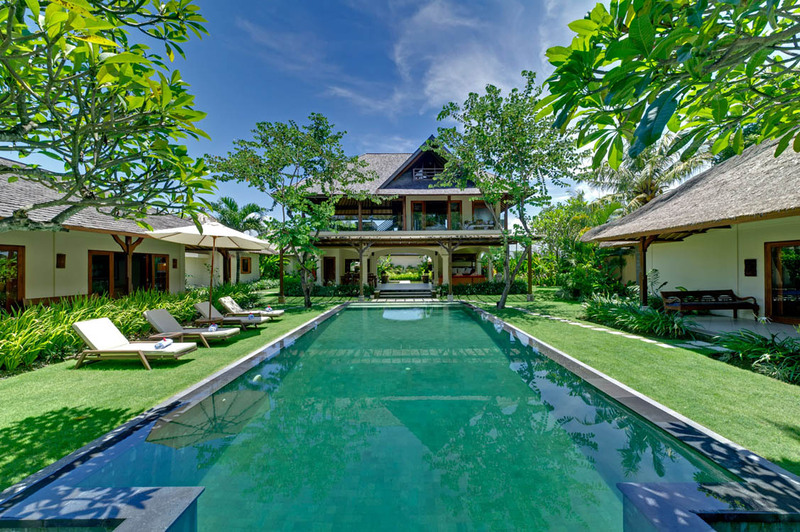 The outdoors of Villa Asmara is a captivating vision of tropical bliss. 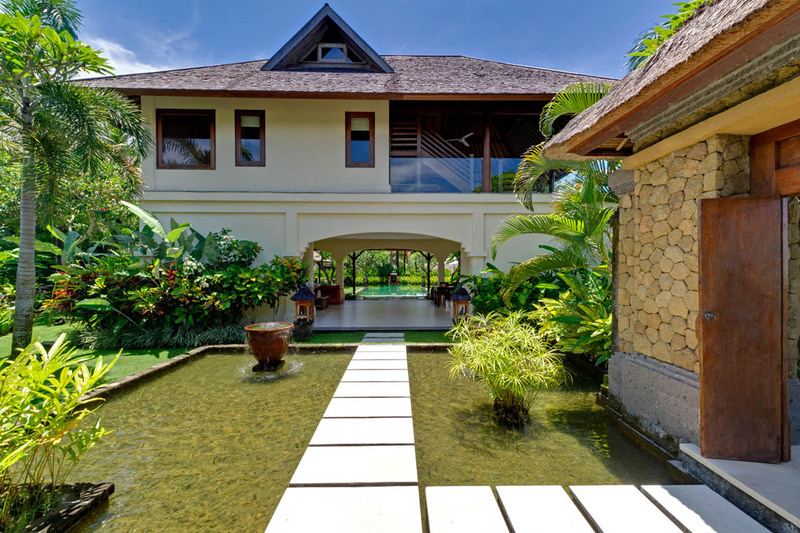 A 12m by 4m swimming pool forms the centerpiece with two single level buildings and a storey building flanking it on all sides. 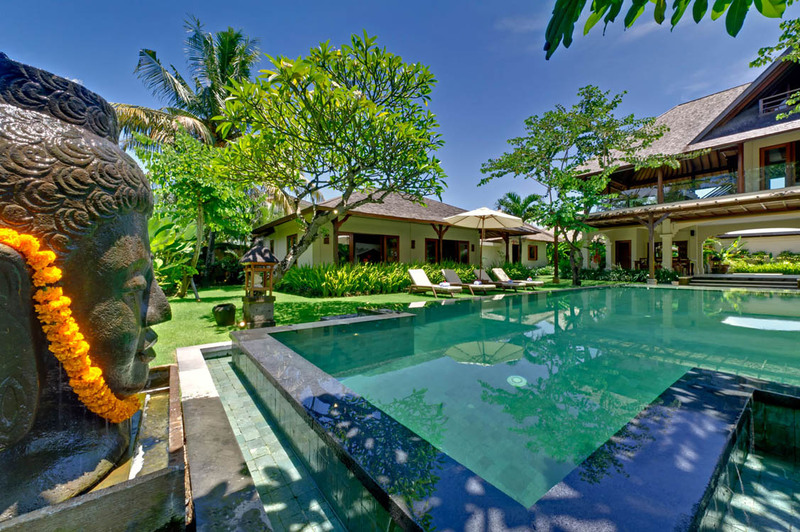 All around are beautiful flowers, well maintained lawns, trees and shrubs, and on one end of the pool is a huge stone statue of Buddha, which adds to the charm of the villa. 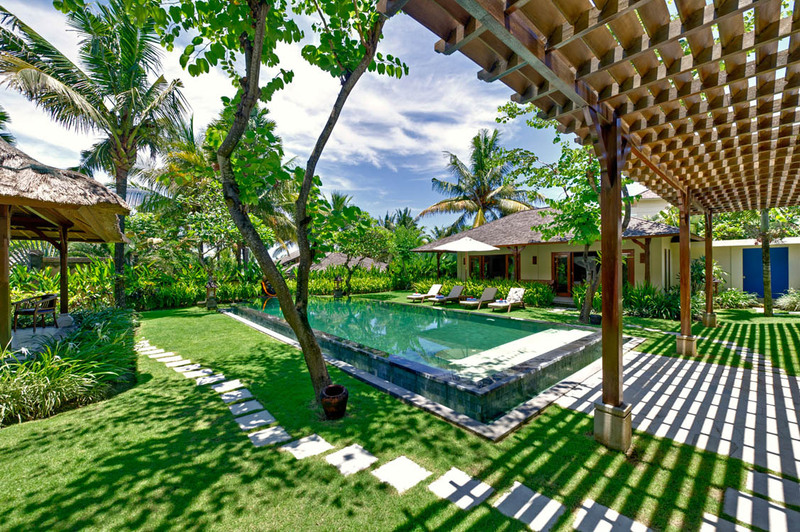 Also beside the pool is an open sided pavilion in which there is a small sitting area where guests can relax and enjoy the beautiful outdoors. 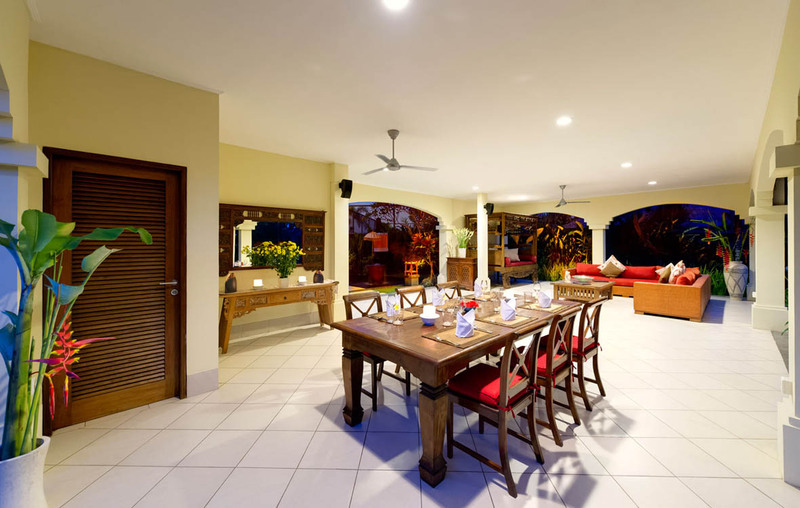 The stunning living room is on the ground floor of the open sided two storey building. 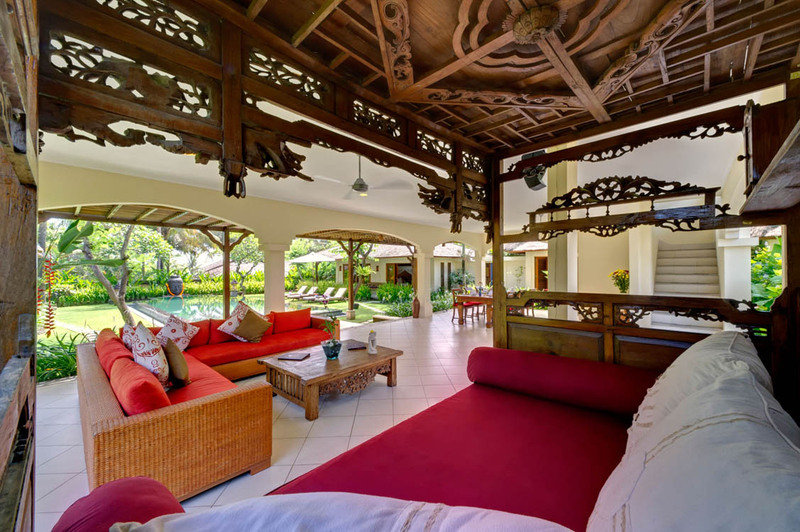 It is beautifully furnished with a rattan sofa set arranged to overlook the pool and gardens. 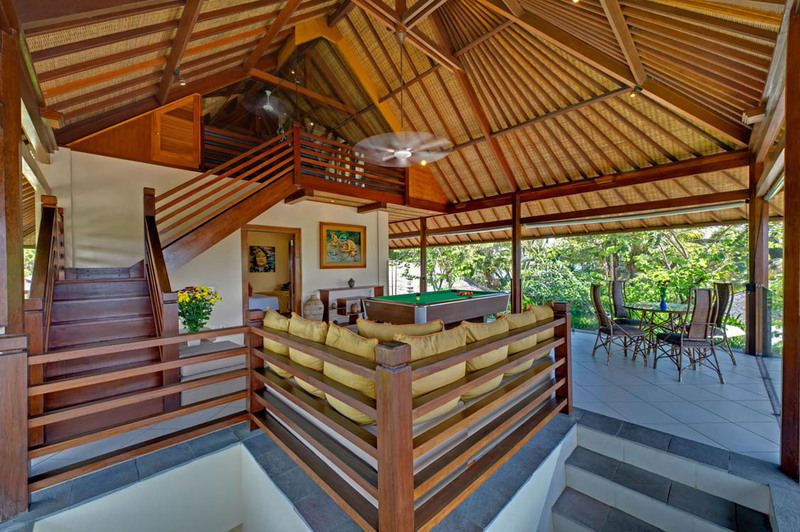 Everywhere you look are beautifully carved wooden pieces of furniture. 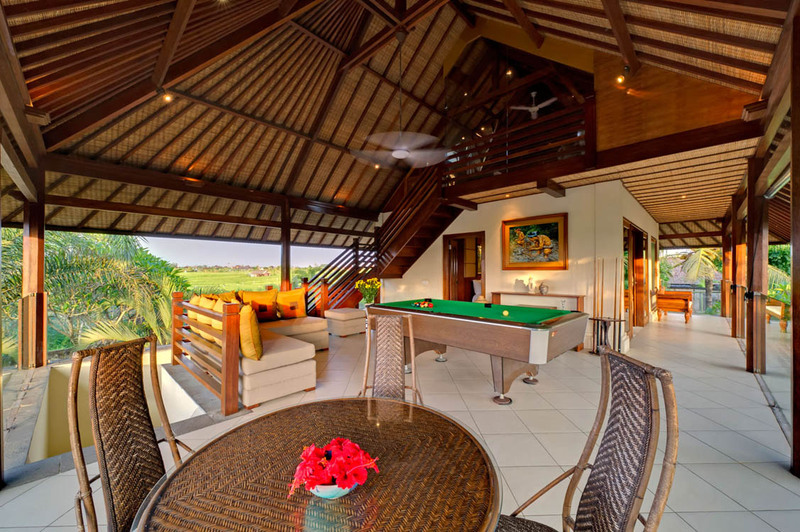 In a corner is a wooden dining set where guests can sit and enjoy tasty meals and on the top floor is a media room where guests can hang out, enjoy a game of snooker and drinks, with a sweeping view of the villa and rice fields. 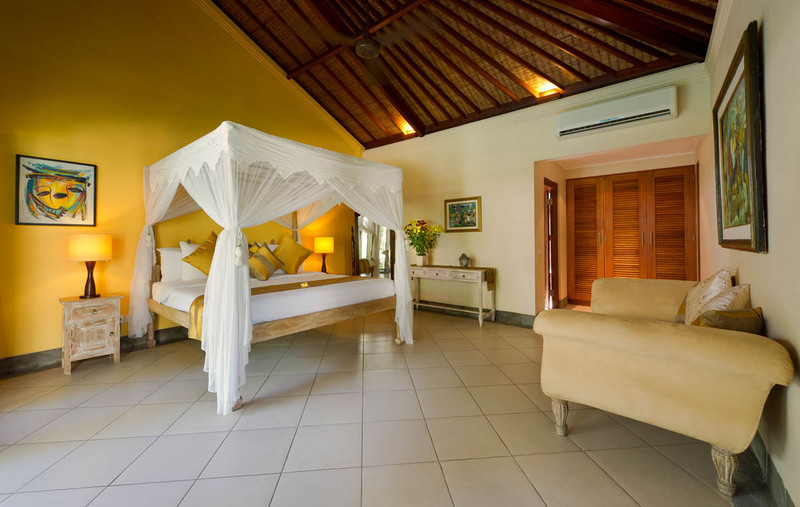 Villa Asmara boasts of four gorgeous bedrooms, three with king beds and one with a queen bed. 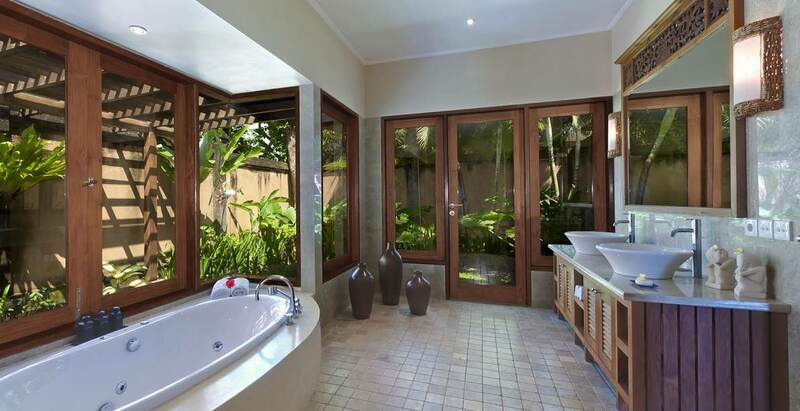 Each room has an ensuite bathroom, is spacious, luxurious and comfortable. 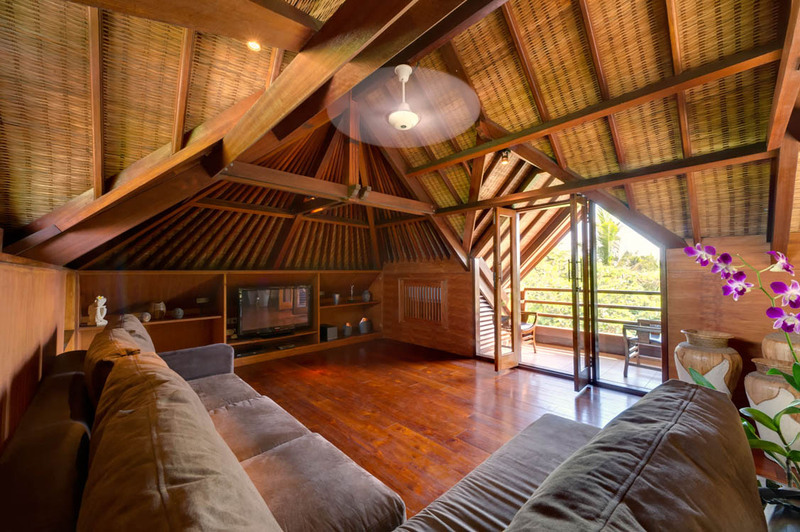 While lovely paintings hang on the walls, comfortable sofas are placed in a corner with matching wooden furniture. 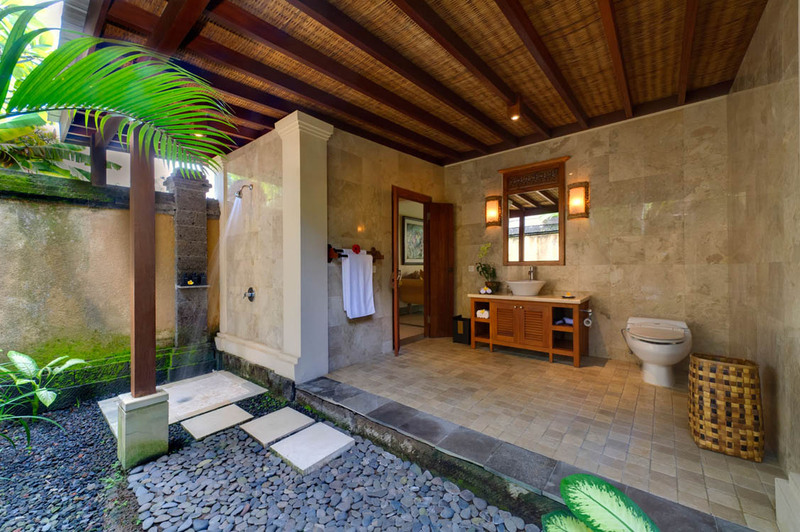 The ensuite bathrooms have rain forest showers and luxurious tubs. 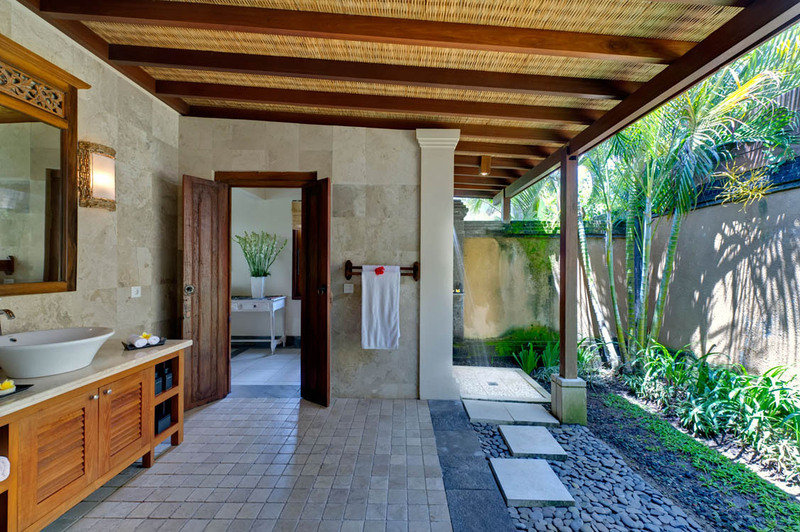 So guests have all the facilities they’d require to be comfortable and relaxed throughout their stay. 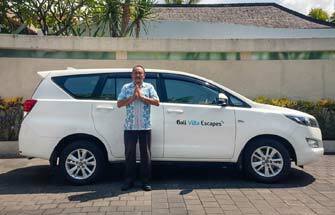 Guests of the villa enjoy free airport pick up, dedicated services of a villa manager, gardener, chef, driver and housekeeping. 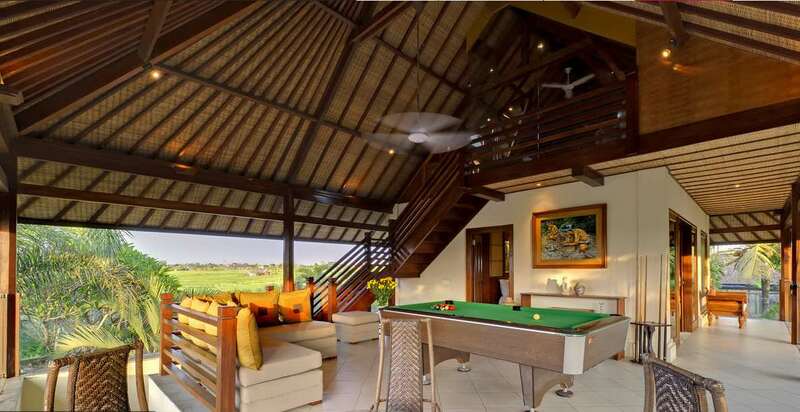 The villa also has a tennis court which is perfect for outdoor relaxation with friends or family. 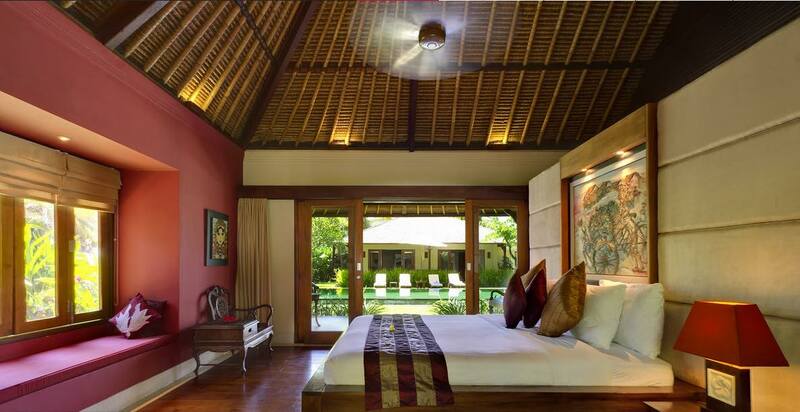 The villa is located in a quiet enclave and it is perfect for a serene and tranquil holiday. 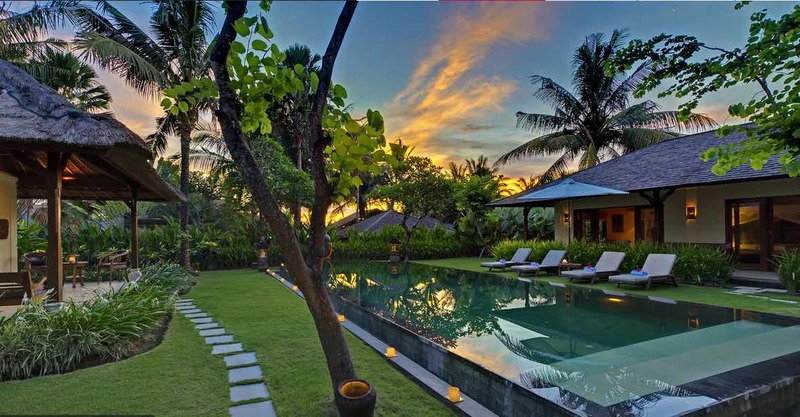 On the other hand, Canggu has a lot on offer from; trendy restaurants to bars, health food cafes, boutiques, beaches, great surf, yoga studios, eclectic and young vibe etc. 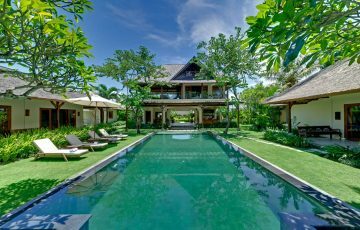 Guests will have an unforgettable time discovering all that Bali has to offer from this fabulous villa that is big on the WOW factor! 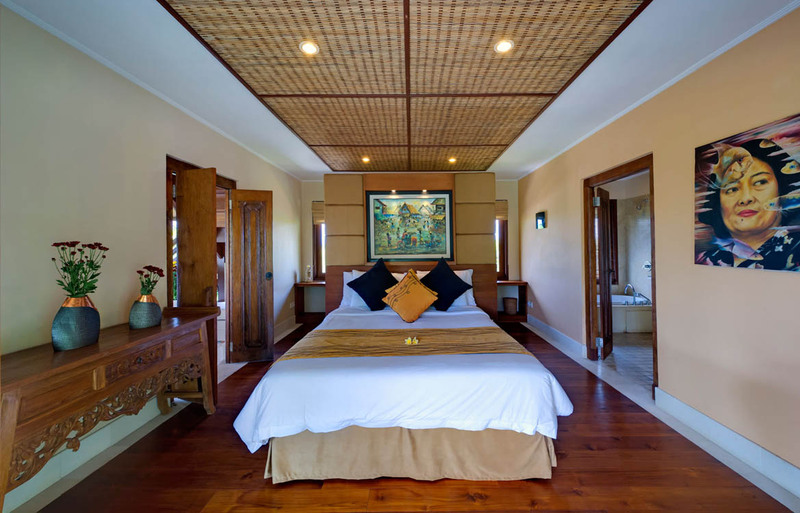 To view other 4 bedroom Canggu Villas or our full range of Bali villas near Echo beach please browse this website or contact our reservation team. 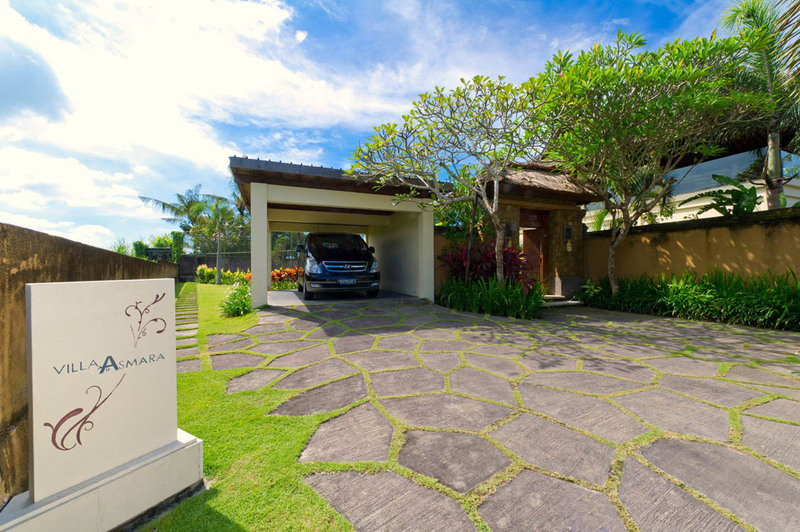 This is a popular Canggu villa rental so please book Villa Asmara well ahead especially if your planning a trip to Bali during the Australian school or public holidays. 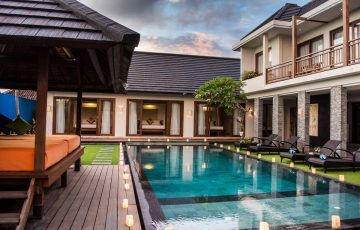 If you need anything organised such as tours, dinner parties, BBQ nights or in house spa treatments and massages even advice on where to go and what to see he will be happy to help. What a dream holiday made even better by the wonderful staff. 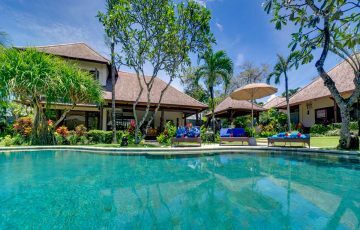 Kids absolutely loved the swimming pool and we can't thank Dewi at Bali Villa Escapes for organising this for us. 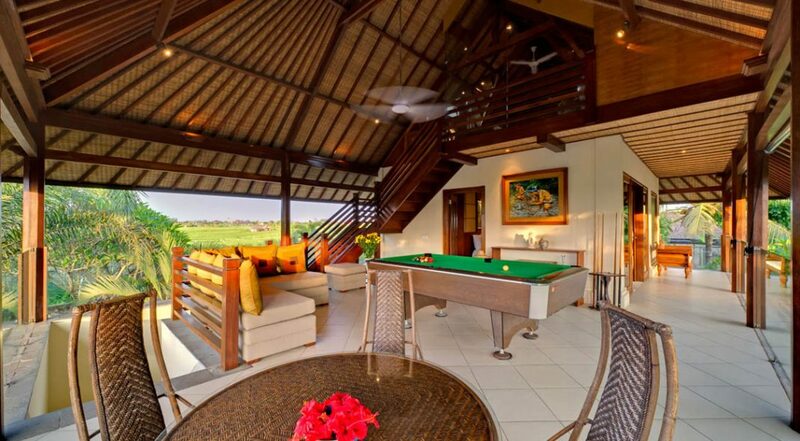 Sensational villa in a really top location. Enjoyed the free airport pick up and those wonderful breakfasts cooked for us. 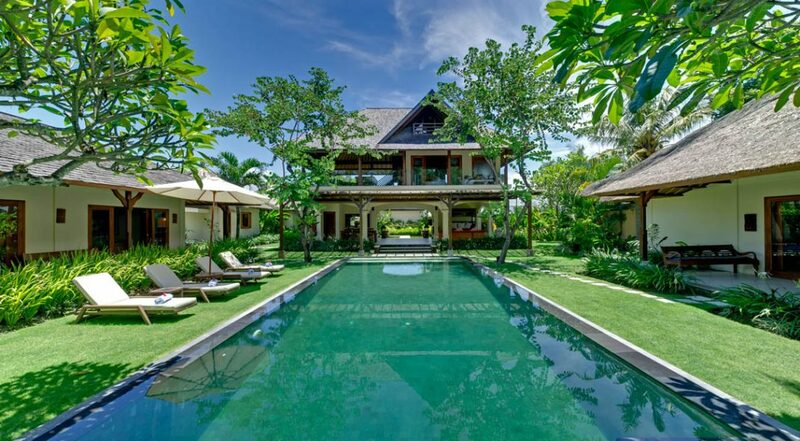 We spent 8 days here over the Christmas period with out family of 6 and would definitely recommend this villa to any one wanting a bit of luxury on their holiday. It really has everything you could possibly want. 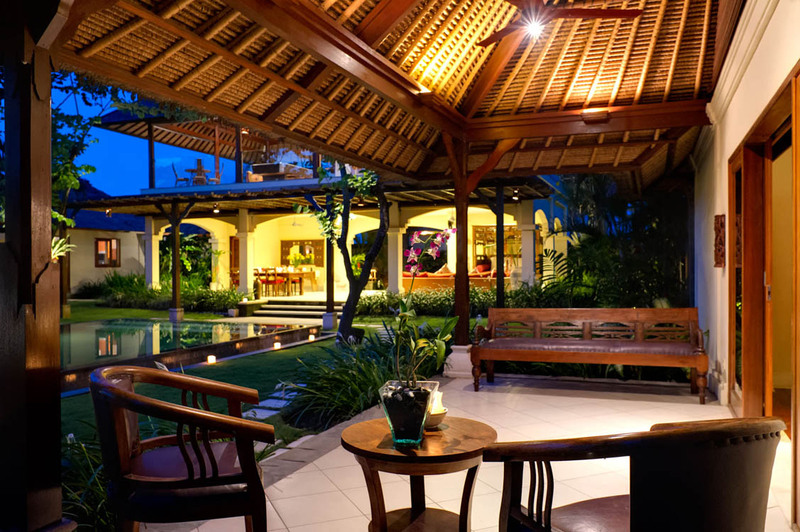 The villa ambiance was divine and we left feeling completely relaxed. 10 out of 10!!! 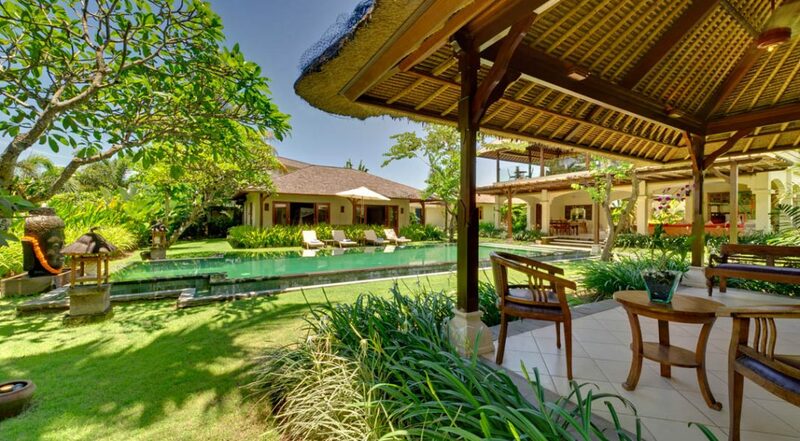 Our holiday at villa Asmara was like a dream. Such a lovely place with the most friendly and happy staff. 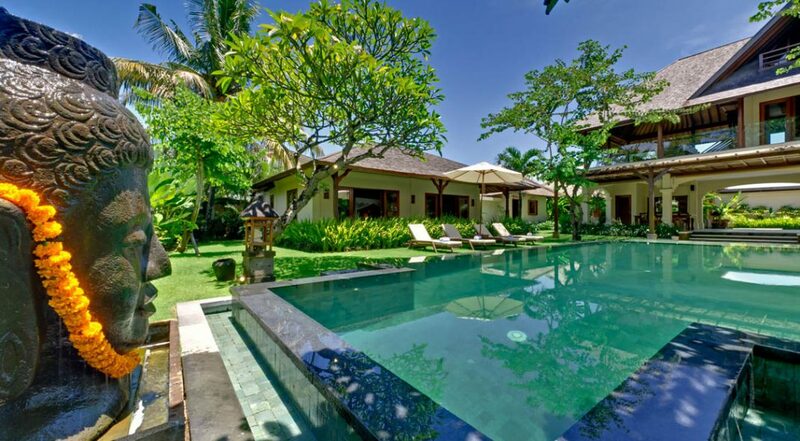 As frequent visitors to Bali we are always looking for a great villa and I think we have found it. Loved the early morning breakfasts by the pool. This was a real treat! 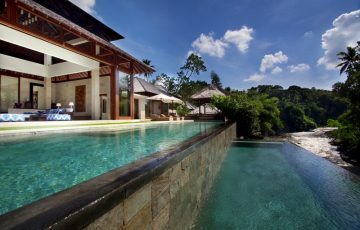 Our family holiday at villa Asmara was a real delight! 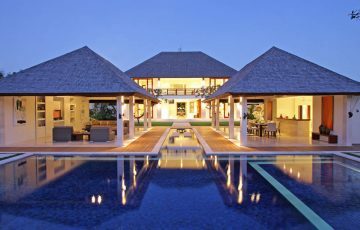 Professional and very courteous staff in one of the best locations I have ever been in - so private and quiet. A massive thank you to everyone who made our stay so wonderful. 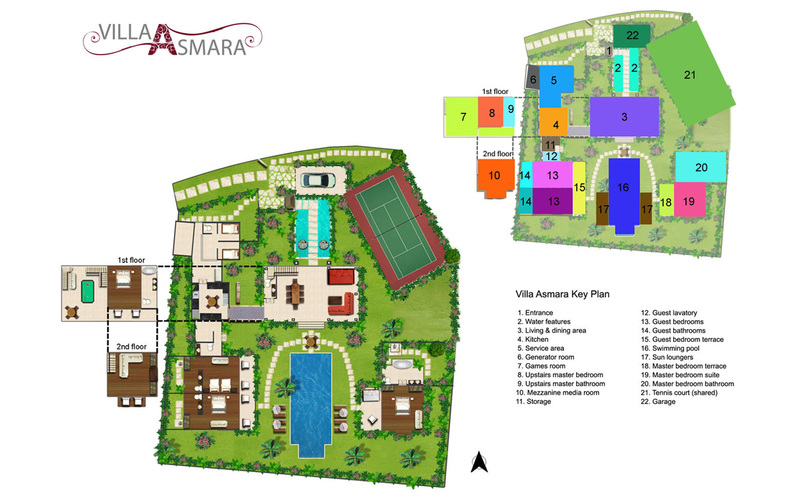 To everyone at Villa Asmara thanks for such a great time and making us feel right at home. Brilliant, loved it, loved it, loved it. 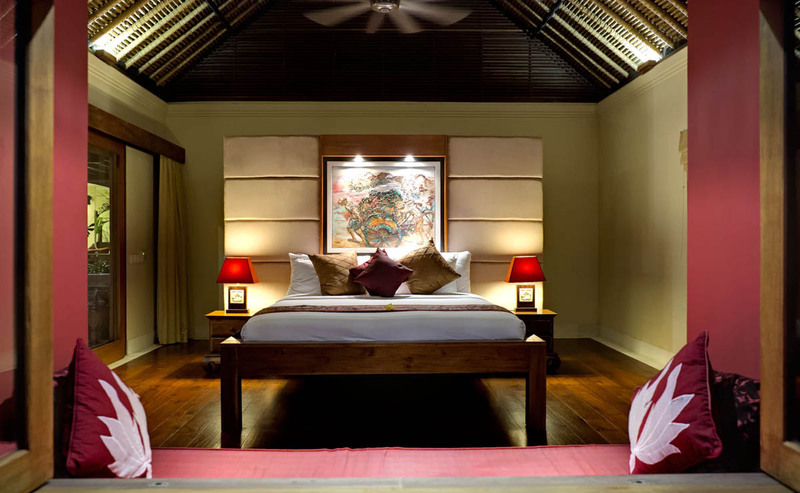 Staff were absolutely fantastic and nothing was too much bother for them. They could teach the world about hospitality. 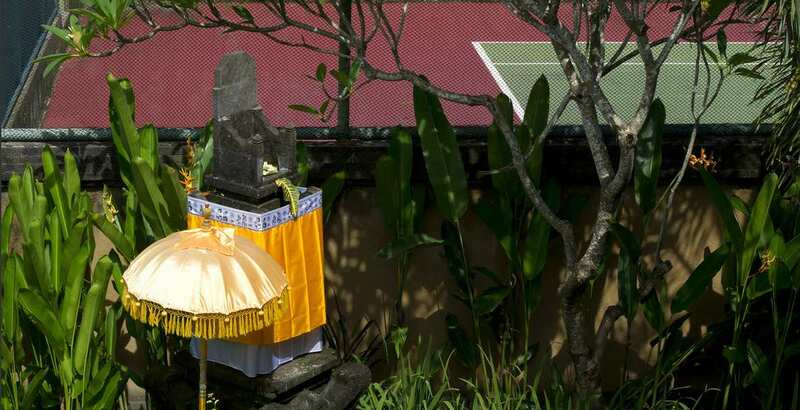 Only downside was the traffic due to the Javanese all bringing their cars over the Christmas, New Year break. I don’t suppose there’s much can be done about that though. 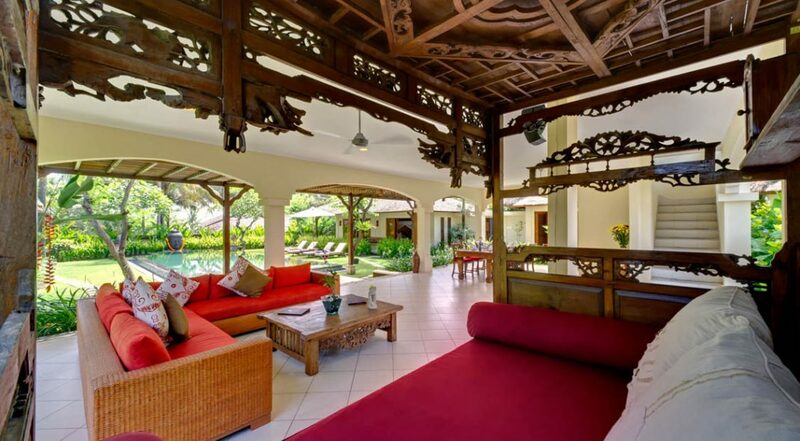 Villa Asmara was an idyllic oasis away from the bustle. Wish I could have packed the staff in my suitcase & brought them home with me.